Frustrated by the lack of political and economic freedom, and enraged by the continuing repression on the island, an armed rebellion was staged by the pro-independence movement in 1868. 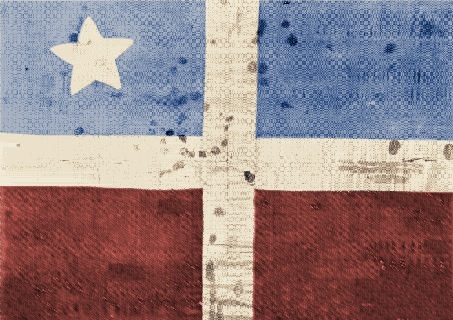 On plans designed by Dr. Ramón Emeterio Betances and Segundo Ruíz Belvis, nearly 1000 rebels gathered on September 23, 1868 in the hacienda of Manuel Rojas, located in the vicinity of Pezuela, on the outskirts of the town of Lares, in the midwest region of Puerto Rico. Poorly trained and armed, the rebels reached the town by horse and foot around midnight. They confiscated local stores and offices owned by “peninsulares” (Spanish-born men) and took over the city hall. Spanish merchants and local government authorities, considered by the rebels to be enemies of the fatherland, were taken as prisoners. The revolutionaries then entered the town’s church and placed the revolutionary flag (the Lares flag), knitted by Mariana Bracetti, on the High Alter as a sign that the revolution had began and the Republic of Puerto Rico was proclaimed under the presidency of Francisco Ramirez Medina. Many of the Puerto Rican rebels were African slaves who had escaped and in hiding. Others were middle and upper class creole that were motivated by the idea of freedom to develop economic opportunities without the restrictions of a foreign feudal power. All slaves who had joined the movement were declared free citizens. The revolt would be known as El Grito de Lares. Spanish forces eventually ended the insurrection when the rebels attempted to take the next town, San Sebastian del Pepino. This entry was posted on September 23, 2008 at 6:00 am and is filed under History, Politics, Puerto Rico. You can follow any responses to this entry through the RSS 2.0 feed. You can leave a response, or trackback from your own site.